This is the last of the Two Freaks. You can see evidence of their strange, flickering, barely consequential presence in Jerry Augustine’s sideways double-take. As the pitcher lifted his hands above his head and prepared to look straight into the camera the Two Freaks darted one last time across the edges of the playing field, one last time across my childhood. Like most of those visited by the Two Freaks, Augustine began drifting toward the margins in the aftermath of the visitation. He was still young in this 1980 card, still seemingly capable of becoming a notable figure in the baseball world. He hadn’t set the world on fire, but he’d had his moments, winning 13 games two years earlier and making a successful shift from the rotation to the bullpen one year earlier, with nine wins and five saves. But after the Two Freaks infused his card with hints of other, stranger worlds beneath this one, Jerry Augustine gradually drifted toward the fringes, as if following the hints. Appearances dwindled, earned run averages ballooned. 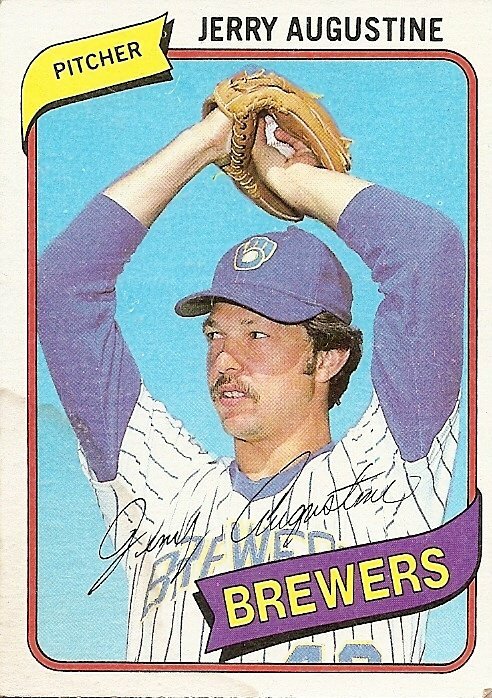 Though still logging some innings here and there as a lefty reliever in both of the Brewers playoff seasons of 1981 and 1982, Augustine was never called on to pitch in the post-season in either year. He was granted free agency by the Brewers at the end of 1984, but no one picked him up. You are currently browsing the archives for the Jerry Augustine category.